It's finally well March and the worst of winter is (thankfully) over! I'm ready for a change of weather, and for some changes in my beauty routine. 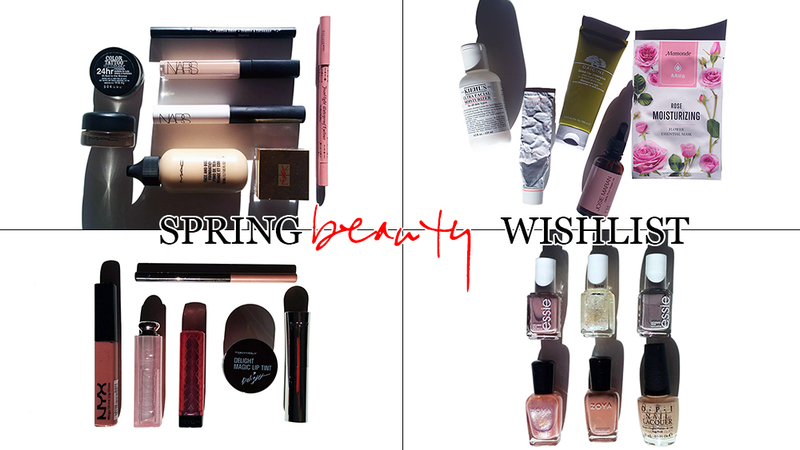 There are some amazing new products for spring that have recently been released that look worthwhile and promising! 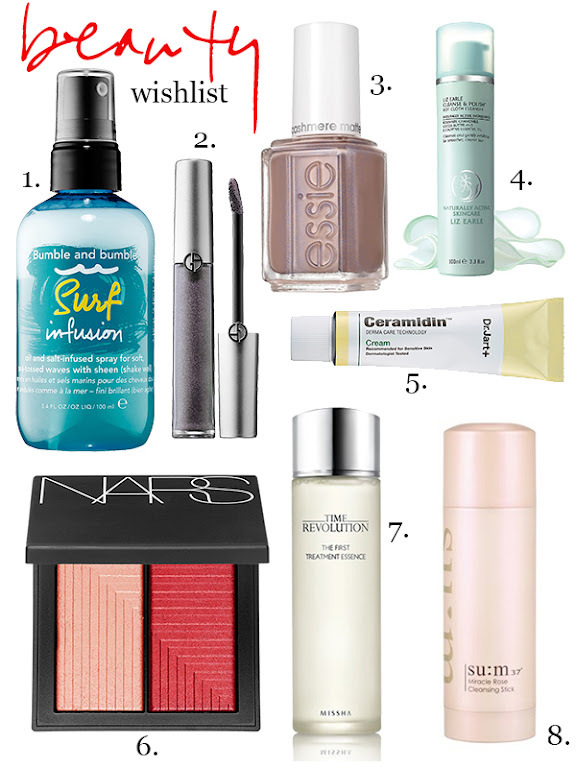 Click through to see what beauty products I'm currently eyeing and itching to try out. 1. Bumble and Bumble Surf Infusion - Currently a VIB & VIB Rouge exclusive, Bumble & Bumble have come out with a new version of their famous sea salt spray. Their new formula has dry oil in the spray. I recently got a shoulder length bob, and that means I need some texture in my hair. The original sea salt spray made my hair a little too crispy to my liking, so I'm thinking this new formula may be a winner. 2. Giorgio Armani Eye Tint - Giorgio Armani just came out with these amazing looking eye tints. It's one of those eye shadows that's liquid, but that sets when it dries and therefore has amazing staying power. 3. Essie Cashmere Collection - It's not quite matte, and it's not glossy. Essie's new collection of polishes have more of a satin like finish. 4. Liz Earle Hot Cloth Cleanser - I've always wanted to try this cleanser. It smells heavenly, and it's supposed to be an effective but gentle exfoliator because of the muslim cloth. 5. Dr. Jart Ceramidin Cream - I tried this on my hand in the Birchbox store the other week, and I loved the slightly herbal medicinal smell the cream had along with how hydrated my skin looked when I rubbed it in. 6. NARS Dual Intensity Blushes - I'm very loyal to my YSL Creme de Blush, but ever since I saw these new blushes from NARS, I've been considering trying a new blush! 7. Missha Time Revolution Essence - It's no surprise this is on my wishlist. I love essences and they've completely changed the condition of my skin for the better (real more in detail about it here and here). I've heard great things about Missha's essence, and it's the next essence on my list to try after I finish IOPE's Bio Essence. 8. SU:M37 Miracle Cleansing Stick - Another Korean product that's on my radar, this cleansing "stick" balm is like a giant chapstick for your face except it's a face wash. SU:M37 is known for using all natural ingredients in their products, and the balm even has real rose petals in it. It's so interesting and different, that I just have to try it. What are you looking forward to getting for spring?